NMAT Syllabus 2019: Graduate Management Admission Council (GMAC) conducts NMAT every year to offers admission in to management courses like PGDM (Diploma) & MBA programs. Registration for NMAT 2019 has started and will continue till 3rd October. 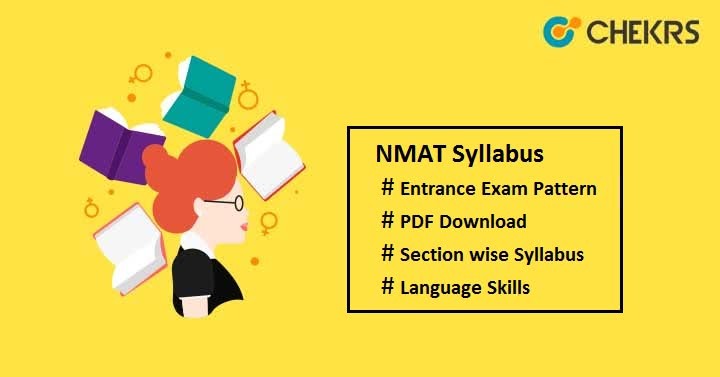 If you are thinking to appear in this exam, you must check the NMAT Exam Pattern with Syllabus to qualify with the highest marks. GMAC has not release any official syllabus for NMAT. So we are providing you the syllabus based on past year’s question papers. The syllabus includes verbal ability, data analysis & sufficiency, mathematical skills, intelligence and critical reasoning topics. Candidates should aware about the whole syllabus to make a strategy for exam preparation. Each topic and its sub-topics should be covered while preparing for NMAT Exam. Here we have shared the topics that are important from the exam point of view. Data Interpretation based on text, graphs and tables. Identifying next number in series, etc. To become familiar with the NMAT 2019 Exam and Question Paper before exam, it is mandatory to know the NMAT Exam Pattern. It will guide you about the mode, medium, time duration, marking scheme, difficulty level of paper, question distribution etc. +1 mark for each correct answer. After completion of exam syllabus, candidates think that they are prepared to crack the exam. It is good to be confident but to analyze your preparation must check the NMAT Previous Year Papers. It helps in improving your speed and accuracy. In the case of any query, drop your question in the comment section below. All the best!! !